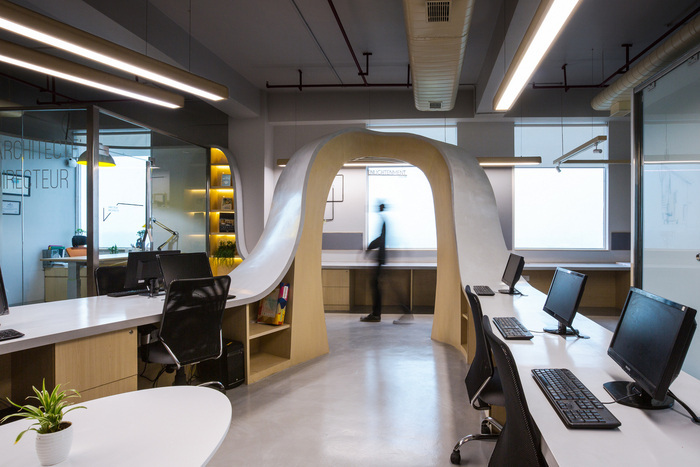 Creative Designer Architects completed their new offices called “the Spatial Stimuli” located in New Delhi, India. An architect’s office is a space that is conceived as a springboard for architectural dialogue, creativity and design. It should, hence unfold and interact in a way that its users feel connected with each other and the spatial setting around. A 2400 Sq. feet open, purely rectangular floor plan had immense potential to explore this aspect. There doesn’t exist a perfect definition of what causes ‘creativity’. However, a brief insight into human psychology and the way our minds respond to its surroundings could probably help shape the right kind of environment for an architect to work in. “Curves are, in general felt to more beautiful than straight lines, They are graceful, pliable and lead to a burst of activity in the brain leading to innovation and experience” quotes a psychologist, Kate Cordon. The curved ‘Enlightenment galore’ is a spatial stimuli that is meant to evoke a dialogue in the user’s mind. This frozen energy is made to travel further, extending across all tables, pulling up wherever required and forming a seamless virtual experience. The areas where the table loop pulls up is housed with a collection of design books below, creating multiple spots of enlightenment. The open design with no ceilings and extra clear glass makes the office spatially expansive and functionally resourceful. The design of the meeting room is extremely fundamental, carrying forward the ‘stimuli’ of the studio in the form of a vertical panel seamlessly blending into a floating ceiling. The studio also has a number of flexible elements such as the ‘sliding white-boards’ which doubles up as privacy screens for the meeting room. The entrance wait area is meant to be the most inviting and soothing spatial setting possible. The genuineness of raw exposed concrete all around and a seamless curved section attempts to interact with the soul. The space is further fused with energy by dint of yellow colored furniture and props. The project ‘display-book’ panel, each for every typology makes a statement right at the entrance along with a thin layer of moss emerging from the ceiling, where visitors can flip around pages to explore the portfolio in detail. The design of an architect’s office is more of an interior ‘architecture’ than ‘design’, traversing into the phenomenology of the space. It requires the innate aura of space and the materials to interact with the people and inspire.